1. Asthma is the most common chronic illness for children nationwide, and locally, our county (Alameda) has the third highest asthma hospitalization rate for children in the state. 2. Asthma is a disease that can be completely managed with proper treatment. In my mind, these two things didn’t add up – if asthma was so easily treatable, why were kids and families still ending up in the hospital because of it? This made the focus of our project clear: we wanted to produce a piece that showed the human impact of asthma on families. As a photographer and multimedia journalist, I approached this story from a visual and audio standpoint. 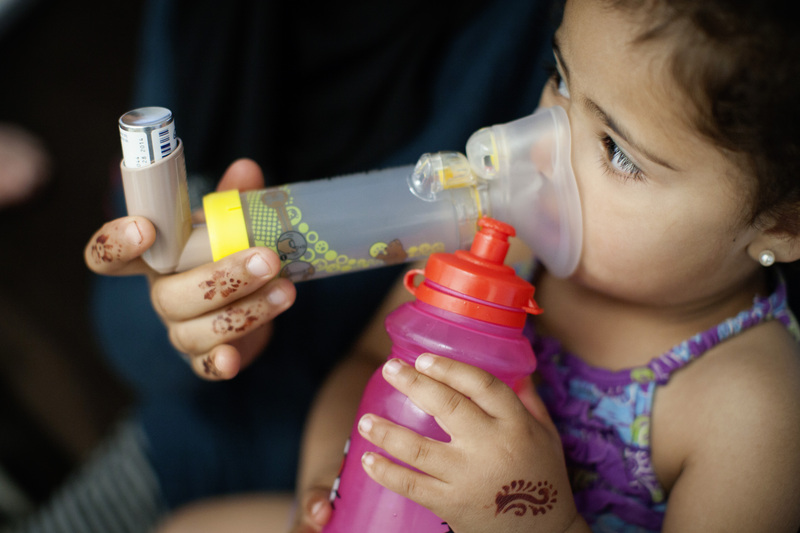 I wanted to find a family who was struggling to manage their child’s asthma and follow them through this process for a few months so I could document how their daily life was affected by asthma. In our research, we learned about the high costs endured by families – the emotional toll on parents who feared and worried for their asthmatic children, the financial cost of medication, hospital visits and missed work days, the educational loss for children who missed more school because of time spent in the hospital or at home recovering from asthma attacks – and I wanted to communicate all of these “invisible” struggles through photos. With any story, access is everything, and it turns out that we never found a family who fit this parameter and was willing to let me photograph and record them regularly. Instead, my content consisted of photos and audio from a variety of families, mainly at clinics and some at home, learning how to treat their child’s asthma from professionals. Because many of these circumstances were dealing with preventive care, I wasn’t photographing sick children or fearful parents. Communicating the severity of the disease without these emotionally driven moments became my biggest challenge. Fortunately for our story, as our deadline for the project was just weeks away, we managed to spend an afternoon in a hospital where we met two families whose children had been hospitalized. This ended up providing a lot of “meat” to my multimedia piece. One child, Johnathan, was so sick he really wasn’t up for talking, and if I’m being completely honest, he was not all that interested in being photographed either. Photographing children can be really tricky. Some children are total hams and getting them to stop “hamming it up for the camera” is usually just a matter of waiting for them to get bored with you. Other children are so involved with what they’re doing they could care less about my being there and photographing them, which makes my job almost too easy. And finally, there are some children who don’t want to be photographed and essentially “shut down” in front of the camera, regardless of whether their parents are encouraging them to cooperate. Johnathan was very close to “shutting down” with me, which means I could see him just on the brink of turning his head away from me or hiding it beneath his hands each time I lifted the camera. After all, he had been in the hospital coughing all night, and since he was so sick and not up for talking, I wasn’t able to connect with him. I sensed his discomfort right away, and so I was very careful to plan out all of the photos of him in my head before actually taking any, making sure that each frame counted and trying not to overstay my welcome. These photos of Johnathan really enhanced our project. I think they immediately communicated how sick asthma can make children, which hopefully serves as a warning and wake-up call to parents of asthmatic children. Johnathan’s mother, Angela, also provided a lot of great audio for the multimedia piece during our single hospital visit. Unfortunately, she did not want to be photographed (since she had been up all night caring for Johnathan), and I do think that my multimedia piece suffered slightly because of this. Being able to show her at Johnathan’s bedside would have really helped convey her worry for her child. However, the greatest lesson I’ve learned in my 6.5 years as a professional photojournalist is to respect the wishes of my subjects. My pictures are so much stronger when the people I’m photographing trust me. Listening to them, asking them if it’s OK for me to photograph them before plowing ahead, particularly in sensitive situations, basically showing respect for them, are crucial to building that trust. 1. In a sensitive situation, such as a sick child at the hospital, you don’t have a lot of time to build rapport with that child to get meaningful content. I found it helpful to have Johnathan’s mother Angela, with whom he feels very comfortable, ask him questions, and their personal interaction provided great audio for the multimedia piece. So in essence, sometimes it helps to have your subjects do the interviewing with each other. 2. When you’re still in the beginning stages of gathering content and the whole piece has not yet taken shape, be sure to photograph each situation in its entirety. This means getting a variety of photos that are shot from a wide, medium and tight perspective, looking for as many storytelling details as possible, and getting ambient audio from each scenario as well. You just never know what you’re going to end up using, and having the variety of material to choose from makes things a lot easier in the end. No viewer wants to see a series of photos shot from the same vantage point – the visual variety really helps to keep viewers engaged. 3. Get creative when you have less content. I had great audio from our interview with Johnathan’s mother, but I didn’t really have enough photos to fill that audio. Instead, I put in a sequence of basically the same photo of Johnathan in the hospital bed, set to very short time frames. The idea of doing this was to help show how bored and fidgety Johnathan was while sick in bed. It probably was not the ideal solution, but it worked given what I had. 4. Don’t be afraid to go out and get more content. Once I had a rough of the multimedia piece, I took notes of holes I needed to fill. For example, I needed some ambient noise of trucks when people were talking about truck traffic, and an overall photo of the Port and freeways really helped as well. I also needed some exterior images of the hospital to give a greater sense of place, and these were all things I went and gathered once the multimedia piece was almost there. These little details added a lot more finesse to the piece. 5. Get the audio tracks transcribed and organized as soon as possible after gathering it. I did not do this, but transcribing all of the audio in one sitting was easily the most painful part of putting the final piece together. If only I had done it as I went along, things would’ve been so much easier. There are different schools of thought on this, but for me, it’s easiest to use the audio to outline multimedia projects and so having the transcriptions of all the audio were really helpful for putting a script of the overall piece together. You can view our entire project here.